Singapore/Dubai – Locus Chain technology is the most government-friendly block-chain in the world as it helps governments achieve the Sustainable Development Goals (SDGs) , especially to eradicate corruption, eliminate poverty and establish the most sustainable and transparent governance, said Khalfan Saeed Al Mazrouei, Locus Chain Foundation (LCF)Co-founder and Chairman (Middle East & Europe). 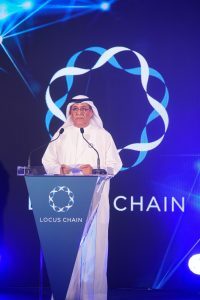 Al Mazrouei was opening the one-day event that was organized by the Singapore-based Locus Chain Foundation (LCF) at the Fullerton Bay Hotel in Singapore on Wednesday (29th August 2018). Her Excellency Shaikha Moaza Obaid Suhail Al Maktoum, Senior Advisor of LCF, Mr. Ahmed Habib Al Gharib, General Manager of Humaid Bin Rashid Al Nuaimi Foundation for Human Development- Ajman and many top delegates from Africa and around the globe such as senior diplomats, high net-worth individuals, business partners, philanthropists, blockchain experts and financial gurus attended the Summit. The Summit explored the scope of expanding ‘Locus Chain’ blockchain technology to all possible industries to achieve a fairer world ensuring justice and transparency in all financial transactions, healthcare services, charity and educational activities. During the inaugural speech Al Mazrouei, said: “The Locus Chain technology is the most government friendly blockchain in the world as it helps governments achieve the Sustainable Development Goals (SDGs) especially, to eliminate poverty, optimize transparency and establish a smarter and sustainable governance,”. “We are proud to announce that the Locus Chain Foundation is on the verge of registering the exchange as it passed all of the listing processes of BiBox, the global coin exchange, which ranked the Locus Chain as No.1 blockchain technology in the world,’ he added. “Locus Chain is the most flexible and scalable Blockchain technology than any other blockchain system. The Locus Chain Foundation has already signed contracts with more than 40 government and private entities worldwide to upgrade their entire systems to the Locus Chain technology. The $50 billion Tunisia Economic City project is the most prestigious one among our government collaborations to implement blockchain technology. 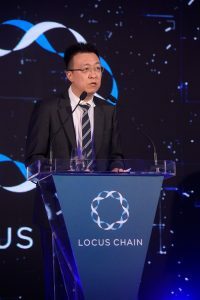 Many countries from Africa, Asia and Europe have been approaching the Locus Chain to get a customized blockchain solution for their current issues, which indicates the unbeatable success of our platform and its potential to be the leader in the industry,” said Mr. Sang-Yoon Lee, CEO of Locus Chain Foundation while delivering his keynote speech on the topic ‘Building a better future with Locus Chain’. Earlier, while addressing the press conference at World Summit, the founder of LCF SeJung Kim said: “Locus Chain technology can help countries fight terrorism and illegal migrants. The element of transparency can be used by governments—it’s being used by Korea—to identify which citizen has a criminal record or engaged in terrorist acts,”. “A government can start a private blockchain technology to ensure its bona-fide citizens are protected from criminals and can manage the entry and exit of people”, She explained. Topics of the Locus Chain World Summit – Singapore, the second major event of LCF since its launching in Dubai last April, included the ongoing cases and resources for the actual application of Locus Chain as a blockchain platform. It also spotlighted the advantages of blockchain technology in areas such as the e-government system, and Locus Chain’s strengths and journeys so far as well as its aspirations for the future. Mohammed Lutfar Rahman, LCF Co-Founder and CEO of New England Equity Ltd, delivered the welcome speech, Amir A. Dossal, Founder and President of Global Partnerships Forum and the winner of the 2010 New York UN Humanitarian Award, and Moon Ho Kim, Chairman KMH Preach Foundation addressed the summit as special guests. Mr. YoungBae Moon, LCF Advisor and Director of Research at the digital finance laboratory of the Korea University delivered a presentation on the topic: ‘Advances of Government Structure and Service Delivery through Blockchain Technology’. Mr. Lu Kun Shan, CEO of Leadtec, delivered the topic ‘Ushering in a New Age of Healthcare: Better Life, Better Care with Locus Chain’, followed by the speeches of Mr. Soo-Han Cho, CMO at Bloom Technology and Dr. Minseok Oh, CTO at SM Wave, Korea, on the topics ‘The Future of Enterprise Blockchain Technology’ and ‘SM-Fi Solution Leveraging Blockchain Technology’, respectively.